The early 1980s was an iconic time for the sport of basketball. By that time, we had already enjoyed the likes of court legends such as Wilt Chamberlain, Jerry West, Bill Russell, and Kareem Abdul-Jabbar. When Larry Bird and Magic Johnson entered the scene, Boston Celtics and Los Angeles Lakers fans had more opportunities for excitement. Each of the two dynastic teams secured another superstar and the conversations around the coast to coast rivalry continued as richly as ever. The 1980-81 Topps Basketball card #34 is found at the top of Want Lists of many basketball card collectors. Due to the history surrounding the card, it's cards like this that keep the hobby interesting and the value appreciating. This card was released at a time when basketball cards, while popular, hadn't caught on to the degree that its baseball counterpart had. For this reason and the fact that adequate preservation methods and price guides hadn't yet been mass produced, mint condition examples are things of great rarity and value. This card is shared by three Hall of Famers, for two of them, this card carries the Rookie Card designation making this one of the most sought after basketball cards of all-time. 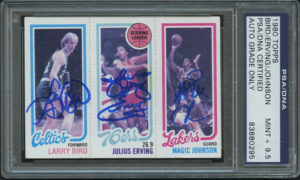 Couple that with thick deep blue autographes of each of the three players: Larry Bird, Julius Erving, and Magic Johnson and this is an instant favorite in any collection. This item has been authenticated by PSA and is offered by Pristine Auction. Click here to see the listing. Remember when people use to sign checks? Depending on your age, you might not. This old-fashioned form of payment was once the financial transaction staple. Today, signing a check is about as antiquated as playing a video in a VHS player during family night. Because nearly all financial transactions have gone digital, checks hold less significance today than ever before, but not this one. This personal check signed by The Sultan of Swat, Babe Ruth, is a true masterpiece. Not only is it in incredible condition, it's earmarked with an ultra rare signature featuring The Babe's first two initials, "G.H. Ruth." After The King of Crash retired from baseball in 1935, he enjoyed spending leisure time on the green. This check was made out for a golf club in 1940, which augments its collectibility both in the baseball and golf markets. This particular piece is in excellent shape for its age. Signed checks from professional athletes circa the first half of the 20th century are highly collectible and prestigious upgrades to any collection.